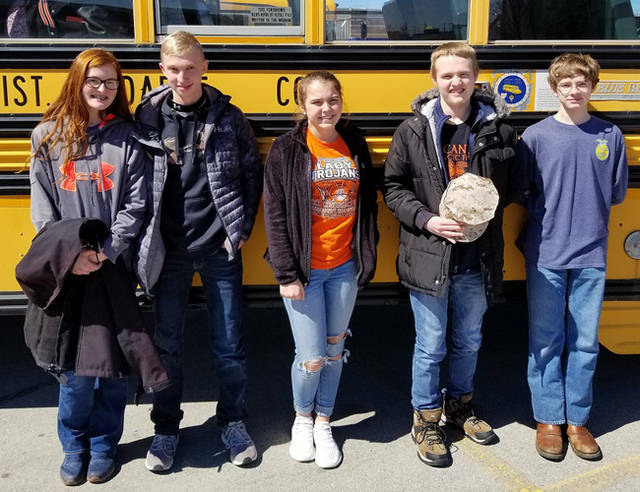 Members of the Arcanum MVCTC FFA who competed in the wildlife management contest were (l-r) Maggie Weiss, Josh Wright, Regan Weaver, Preston Gibson and Cole Besecker. Members of the Arcanum MVCTC FFA who competed in the spring dairy judging contest were (l-r) Brody Williams, Anna Loxley, Maggie Weiss, Hailee Rehmert, Sidney McAllister, Ellie Fout and Landon Haney. 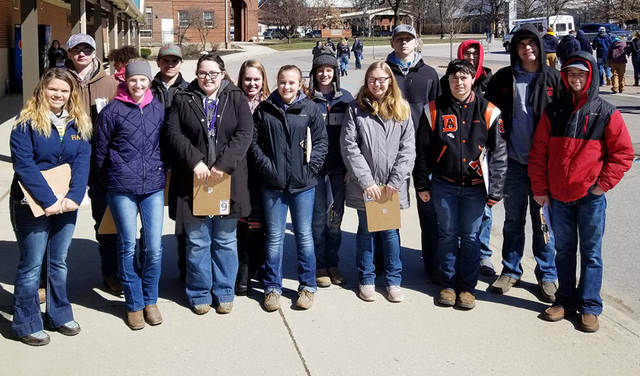 Members of the Arcanum MVCTC FFA who competed in the spring general livestock judging contest were (l-r) Laney Fourman, Raymond Denniston, Emily Wenning, Blayne Hess, Sidney McAllister, Anna Loxley, Alexis Wilcox, Austin Stephens, Eleanor Pease, Cael Gostomsky, Vance Wetzel, Jake Goubeaux, Zach Smith and Luke Brinksneader. 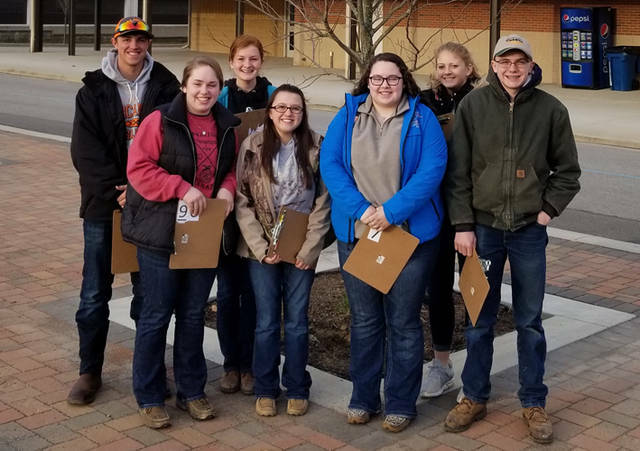 COLUMBUS – Members of the Arcanum MVCTC FFA competed in the Ohio FFA Spring Judging Contest on March 23 and 28 in Columbus. Members competed in general livestock judging, wildlife management and dairy judging. In the general livestock contest, members evaluated beef cattle, sheep, goats and swine. They placed classes and completed market grids and production charts. Members of the high school team were Sidney McAllister, Blayne Hess, Jake Goubeaux, Anna Loxley, Alexis Wilcox, Emily Wenning, Luke Brinksneader, Raymond Denniston, Vance Wetzel, Cael Gostomsky, Zach Smith, Laney Fourman, Austin Stephens and Eleanor Pease. The team placed 61st in the state. The wildlife management team identified mammals, amphibians, fish, birds and plants. Members of the team were Josh Wright, Maggie Weiss, Regan Weaver, Cole Besecker and Preston Gibson. The team placed 38th in the state. The Arcanum MVCTC FFA dairy judging team members were Maggie Weiss, Landon Haney, Brody Williams, Ellie Fout, Hailee Rehmert, Sidney McAllister and Anna Loxley. During that contest the members completed the live evaluation of four classes of dairy cattle, answered objective questions about the classes, and completed a pedigree evaluation class and a sire selection class. The team placed 22nd in the state.